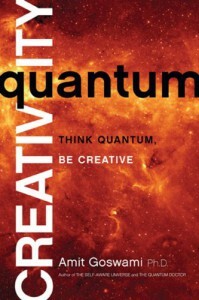 Just as an electron leaps from an atom's inner orbital ring to an outer one, creative ideas occur just as suddenly. Such quantum leaps inspire this book's title. But it's a mish-mash. True, there's some physics in it. There's also ideas from Hinduism, Jungian Psychology, and some others that are the author's own. However, the book lacks a coherent theory or argument. And that's why it doesn't work for me. I didn't finish this book, but I did read enough to know it wouldn't provide the answers I sought. This is the paradox I want to solve: Quantum Physics proves that observers can't be separated from observations. This implies, as Goswami believes, that consciousness is a force in nature. Yet psychologists treat consciousness as an epiphenomena. An epiphenomena is one that occurs parallel to the phenomena under study. This means one can study activity within the brain and the behavior it creates, but one can never say anything about consciousness. So, what is consciousness? Goswami addressed this more thoroughly in a previous book, The Self-Aware Universe: How Consciousness Creates the Material World. When I initially read this book I knew less about physics than I do now. I'm currently re-reading it. I wasn't convinced by Goswami's argument the first time. I'll let you know if a second reading changes my mind.